Agent and attorney Kelly Weiss Rogondino and concert promoter Gary Hinston offer their industry knowledge and career advice to Point Park SAEM students during the Pollstar Live! Music Conference. Eight Point Park University sports, arts and entertainment management majors were selected to join music industry professionals across the country for the Pollstar Live! 2017 Conference, held Jan. 31 through Feb. 2 in Downtown Los Angeles. "Pollstar is a weekly music magazine read by just about every talent manager, promoter, venue manager and record label exec in the music industry," said Ed Traversari, M.B.A., SAEM associate professor who spent 35 years as a Pittsburgh concert promoter for DiCesare Engler Productions, and later, for Live Nation. Through Traversari's industry connections, Point Park students were personally introduced to various agents, managers and promoters in the music business. "I received one-on-one, specialized advice from industry professionals who are in positions I would love to be in one day. It was amazing to hear how supportive they were of my generation getting involved in the business they have dedicated their lives to," said Marissa Hernandez, a senior SAEM major from Whitehall High School in Whitehall, Pa. These professionals included Kristine Marshall, talent agent for International Creative Management in NYC, Kelly Weiss Rogondino, agent and senior business affairs attorney for Paradigm Agency in LA and Brittany Hoydich, assistant for the college and lifestyle marketing department at Universal Records in LA. 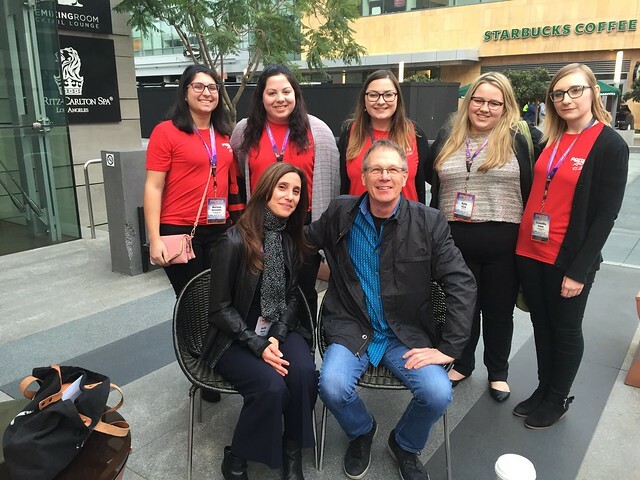 In addition to networking, the SAEM students volunteered at the conference and attended workshop sessions on various live entertainment industry topics such as ticketing, corporate buying experiences, data driven concert touring, venue management, the Latin music business and more. "My favorite part of the conference was being a panel assistant for a panel session about Las Vegas entertainment. I got to meet with seven individuals who are all very influential booking artists for shows and residencies in Las Vegas. It was really cool to network with them and hear about their jobs. I also enjoyed all of the networking receptions and the awards show at the end of the week," said Angela Thomas, a senior SAEM major from Moon Area High School in Moon Township, Pa. The conference's keynote speakers were legendary music artist Alice Cooper and his renowned manager, Shep Gordon. "I decided to apply to attend Pollstar again this year because of the great connections I made at the conference last year. The panel sessions were my favorite part of this year's conference. One panel in particular talked about what mentors in the industry look for in mentees. This panel changed the way I went about networking and made me feel more confident when speaking with industry professionals," explained Ericka Thomas, a junior SAEM major from Avonworth High School in Pittsburgh, Pa.
Baylee Zimmerman, a junior SAEM student from Kutztown Area High School in Kutztown, Pa., said: "The panels offered a solid coverage of all the topics we learn in our SAEM classes, but on a bigger scale. It was amazing to hear advice from industry professionals who are currently working in the field and then being able to connect with them afterward." The Pollstar conference also offered a career center where student attendees could post their resumes as well as apply for job openings in the industry across the nation. Zimmerman added: "Having the opportunity to attend this conference gave me the chance to meet so many individuals in the live entertainment industry from across the country. Hopefully down the road, the people I met and connected with will be able to help me with my career goals."